October's Chamber Luncheon got a lot accomplished in a short time as it was a dual purpose event containing both the Chamber's Annual General Meeting as well as hosting guest speaker Brad Ferguson, President and CEO of the Edmonton Economic Development Corporation. The afternoon began with a report on the financial health of the Leduc Regional Chamber of Commerce given by Treasurer Andrew Canham. In a nutshell, and to quote an old saying, the Leduc Chamber is, “as healthy as a horse.” Reporting a surplus for the first time in several years the Leduc Chamber currently has $85,000.00 in the bank due to increased membership and strong expense control. Andrew shared that the Chamber's wage costs had actually decreased over the last few years while membership has substantially increased. He stated that the Chamber is "cautiously optimistic" about 2014 as well, expecting to still have a surplus, but maybe not such a large one. To give an example of the growth in the Leduc Chamber over the previous year, several impressive stats were listed in their 2012/2013 Annual Report including 16,500 guests that attended the luncheons, 146 new members joined the Chamber bringing their current membership total up to 708 businesses, 45 events hosted by the Chamber, 25 grand openings and ribbon cuttings, 52,562 website page views and 537 Twitter followers. A new board member was also welcomed onto the team at this AGM and between three talented and qualified nominees, Laura Tillack of True Touch Massage Therapy was voted in as a new Director with MLA George Rogers giving her the Oath of Office. Chamber E.D. Shaun Green then introduced Brad as the speaker for the day by informing everyone that Brad had not only been voted one of Alberta's 50 most influential people in 2013 by Venture Magazine, but Shaun looked to him as a great personal mentor as well. Brad began his talk by going over some of the many changes that have recently taken place at the EEDC. He shared that he had just passed his one year mark with the organization but that on his first day he had been approached by a gentleman who bluntly asked him "So, how long are you planning to stay here?" Instead of being offended Brad stated that that was exactly the right question to ask of any leader. "You need to know if someone is going to stick around and make a difference." he said. "Right now 60% of our organization has been here less than one year with 24% of those people in new positions. We need to focus, build leadership, and communicate value so we can become a powerhouse of opportunity for this region." 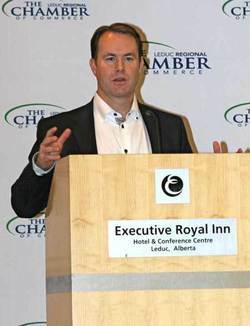 Since he took over the leadership of the EEDC Brad shared that "We now have a lineup of people wanting to work for us. People want to work for an organization that wants to change and uplift things. We need to be entrepreneurial, take risks and allow our people to try, as well as fail, as long as they pick themselves up again, dust themselves off and continue on. We need to be the change. It starts with us." He then spoke on the subject of branding, noting the importance of this tool by bringing up the vandalism recently done to the Welcome To Edmonton signs, commenting that this is not necessarily the type of branding a city would want to have, which drew a laugh from the crowd. Brad stated that branding a city or region is different than branding a product. The area needs to identify why it is unique and different. "What does everyone believe about themselves?" asked Brad. "When there is a problem about how the world perceives a place it is because there is a problem in how the place perceives itself. How people perceive us, if we've done it right, is worth billions." He spoke of how the right image can draw business to the area as well as attracting people that want to make the region their new home. This is how a city remains vibrant and viable. Ending his presentation Brad likened economic development to being a team sport. "However, there is so much opportunity here we don't have to compete with one another. In closing, after thanking Brad for his presentation and gifting him with a token from the Leduc Chamber, Shaun came to the podium again to remind everyone about the Election Forum being held at the Maclab on Thursday October 10th, and to encourage everyone to get their tickets to the next luncheon being held on November 1st at RedTail Landing Golf Club before tickets sell out.